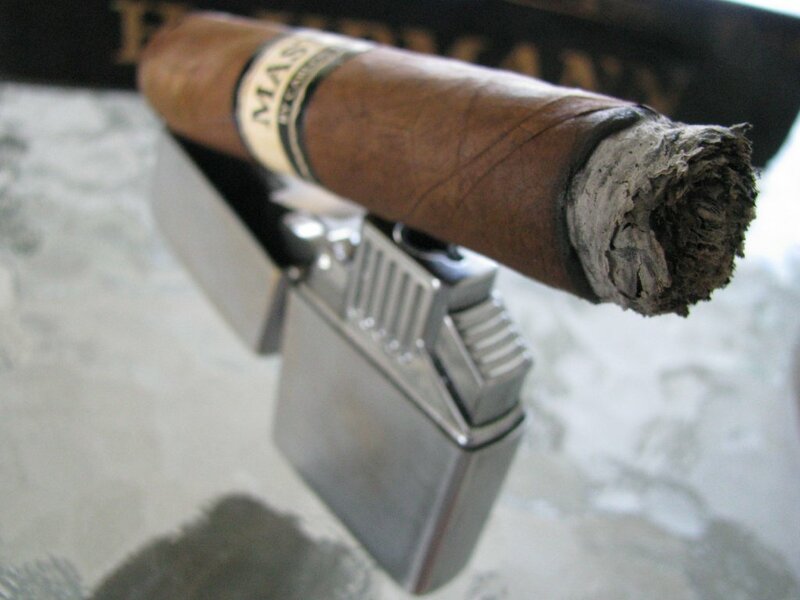 Well folks, it’s time to gather around the proverbial fire – or literal, as the case may be – and talk about a cigar. This week, we’re looking at the Torano Master series, specifically the robusto (5X50). 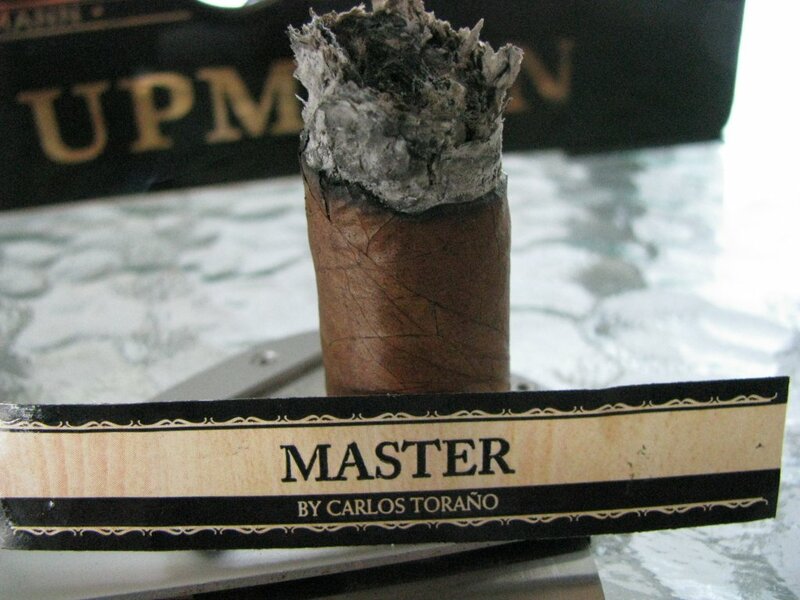 It comes from the Torano family, and according to their website the blend is a collaboration between Charlie Torano, the current head of the company, and Felipe Sosa, “master” cigar roller (hence the series name, and the presence of Felipe’s image on some of the packaging). The blend is a concoction of Ecuadoran Habano wrapper, Nicaraguan (Esteli) binder, and Nicaraguan (Esteli & Jalapa) filler. 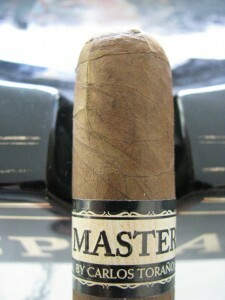 The Master series is intended to only be available at brick and mortar tobacconists. The initial once-over for this stick reveals a very silky wrapper – not oily to the point of producing a sheen on its surface, but very smooth to the touch. There are some veins in the leaf, but they are sparse and unobtrusive. The aroma at the unlit foot is faintly reminiscent of hay with just a little spice – it produces a bit of a tickle in the nose rather than an identifiable odor. A quick sniff of the wrapper gives the same impression, but still very slight. The cap of the cigar telegraphs every bump of the tobacco underneath, but proves pliable enough to handle clipping without tearing during the cut. The draw is firm but free, and very sweet to the palate – imagine figs and hay. The construction is solid throughout the stick, with neither void nor highly dense areas to speak of. The initial light surprises me with an explosion of cedar flavor. It is very powerful and quite recognizable, in fact. 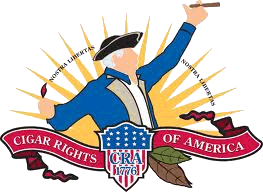 I know some folks who are turned off to cedar flavors in their cigars. I happen to really enjoy it, as long as it doesn’t stray too far into bitterness. There is a fine line between cedar, cream, and spice versus harshness, astringency, and bitterness. I can say that in the Master, at least in this one, that is not the case. There is just enough creaminess to temper the cedar. Being one of those folks who strongly associates flavors and aromas with memories, I am instantly transported back a decade or more to a time when I did some hobby work on cedar lining for some humidors. The cigar produced an aroma not unlike the seared cedar dust that filled the air when sanding the wood for that project. There is also a noticeable tickle in the nose; a very slight burn but not uncomfortable. I would, however, recommend drawing in a little air alongside the smoke if you intend to retrohale this stick in the early minutes. By the one-inch mark, both the cedar and spice has subdued, although the cedar is still very prominent. The spice has begun to present more of a pepper flavor and less of a feeling by this time. The burn is very good, and has evened out perfectly, with the ash hanging on to about an inch or so before falling. Its appearance is somewhat flaky, but internally it seems to be quite sound. The construction on this cigar is remarkable heading into the second inch of smoking. It is a no fuss – no muss kind of stick. Within the second inch, the cedar flavor is still dominant, although calmer than the initial light. It does transition to a sweeter version of itself by the end of this section, however. Toward the end of this period, and into the third inch, I pick up a little nuttiness in the mix which is very pleasing. There are also some “darker” flavors that weave themselves in and out of the smoke – notes of leather, raisins, and some of the fig noted earlier. The burn here wandered ever so slightly, but a quick touchup corrected that with no issue. I should mention this was not a serious problem; routine maintenance, really. I just happened to notice because it was the first time I had even thought about tinkering with the cigar. The sidestream smoke has an aroma very different from the flavor produced in the mouth – it is considerably darker, more leathery than the flavor produced. In the final stretch of the cigar, the strength jumped a notch or two. I would still place this firmly in the “medium” range, but it was noticeably stronger toward the end. It was never overpowering nor harsh in any way, which scores big points with me personally. The smoke did become slightly astringent at one point, but a short purge cleared that entirely. Once that astringency began to creep back in a few minutes later, I knew the cigar was signalling its end. The finish is lingering and sweet, almost woodsy in nature. In my years of smoking cigars, I’ve never been a particularly dedicated devotee of Torano products, but for no other reason than my tastes tend to flit about from maker to maker with few exceptions and I never settled into a groove with a Torano blend (at 250lb, I don’t know that anything I ever do could be called “flitting,” however). This cigar may just change that. It is certainly my favorite product to date from the Torano family, and one of the better sticks I’ve tried in recent months. I do chalk this up to my appreciation for this flavor profile, however. At box prices of ~$4.75 per stick for the robustos in the Tampa area, it is definitely boxworthy for me. I will likely be picking up more of these in the near future, and would highly recommend them to anyone – with the caveat the if you do not enjoy cedar in your smoke, you probably won’t enjoy it as much as I did. If, however, you’re a fan of woodsy flavors leaning sharply into the cedar camp, you will most definitely like this stick.